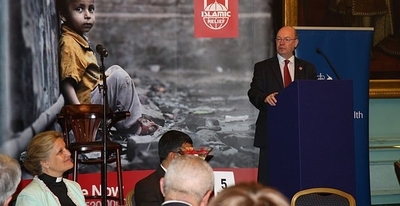 An Islamic Relief event in London in 2012, image via Wikimedia Commons. Hurricane Irma helped out Islamic Relief on September 7, after an amendment barring federal grants to the Islamist charity was dropped when the sponsoring congressman rushed back to Florida to deal with the oncoming storm. Islamic Relief (IR) and a number of prominent Islamic voices, including Linda Sarsour, did not attribute the withdrawal of the amendment to an Act of God, but rather claimed its failure was due to the advocacy and mobilization of its supporters, which included Oxfam, American Jewish World Service, Catholic Relief Services, among others. IR's claims are patently untrue. Representative DeSantis explains: "Due to Hurricane Irma, I left Washington on Thursday to help my family and community prepare for the storm. I was thus unable to offer my amendment, but remain committed to blocking taxpayer funds for organizations with ties to terrorist groups such as Hamas." Recent expressions of support for IR from politicians, charities and various online personalities are sorely misguided. For its entire history, IR has been managed by prominent Islamist operatives closely linked to the international Muslim Brotherhood. In 2015, the United Arab Emirates, following a similar ban in Israel, designated IR as a terrorist organization because of its links to Hamas and the Muslim Brotherhood. And in the last few years, both UBS and HSBC have closed IR bank accounts over concerns about terrorism financing. IR officials openly promote extremist ideas. Khalid Lamada, the chairman of IR's U.S. branch, has published text praising the "jihad" of the "Mujahidin of Egypt" for "causing the Jews many defeats," as well as posts that praise Hamas for inflicting a "huge defeat" against the "Zionist entity." One recent trustee of Islamic Relief Worldwide (IRW), the charity's headquarters in Britain, was Ahmed Al Rawi, who signed a declaration in 2004 supporting jihad against British and American forces in Iraq. An amendment banning grants of government money to Islamist groups is an important and necessary step in the fight against extremism and terror. IR has spent decades insuring itself against such actions by soliciting the support of politicians, journalists, various faith groups and other charities. IR's response to the planned amendment on September 7 was a test of its decade-long effort to deceive its well-meaning but naive public partners. To preserve this deception, IR turned to Congressman Keith Ellison, who wrote a letter to all members of the House urging that they vote against the amendment. Ellison informed his colleagues that "IRW has never been affiliated with Hamas or the Muslim Brotherhood." Again, this is simply untrue. Key IRW officials have been named as top Muslim Brotherhood officials by the German government and British media. IRW's co-founder, Essam El Haddad, even served as the foreign policy representative of the short-lived Muslim Brotherhood government in Egypt. Once that government fell, Haddad was convicted on terrorism charges, including his collaboration with Hamas. Nevertheless, Rep. Ellison continues: "This amendment singles out IRW for its religious affiliation. This is another attempt to criminalize and demonize organizations that are affiliated with the Muslim community." This particular deception is IR's most efficient argument. By claiming to represent all American Muslims, and thus to be a victim of anti-Muslim bigotry, charities such as IR can hide the fact they belong to a dangerous Islamist network that has little mandate from ordinary Muslims. IR relies on claims of 'Islamophobia' to amass further support from non-Muslims keen to show off their progressive credentials. IR has been able to build such an enormous franchise of charities around the world not, in fact, because of support from Western Muslims, but because of the legitimacy and millions of dollars of funding it has received from Western governments, non-Muslim charities and faith groups. IR officials have spent decades building these partnerships -- seeking endorsement from credulous politicians, puff-pieces by incurious journalists and interfaith falafels with naive faith leaders. These connections have served to sanitize IR's history of extremism and safeguard it against future criticism. Islamic Relief is a dangerous organization. In America and Europe, it brings extremist preachers to speak before Muslim youth; and overseas, it is financially connected with violent Islamist movements. There are plenty of Islamic charities, worthy of support, whose officials and guest speakers do not advocate killing Jews and American troops. Islamic Relief is not one of them. Islamist duplicity must be revealed, and the taxpayer must stop subsidising this global charity's extremism.